When I go the movie theater, I am always enticed by the candy in the brightly lit case. Now that I have kids, I see how their low position makes it almost impossible to avoid buying a package of candy for $3.75. Ouch. WHOPPERS always are sitting there in their red and purple box alongside the MilkDuds. If I am organized enough before I get to the movie theater, I buy a package of candy to sneak past the ticket taker. Unfortunately, I don't have many nice things to say about WHOPPERS. They are a whopping 360 calories for the box (excuse the pun), and they have very little nutritional value. I don't really like how they taste. They have a soapy or waxy taste to them. All I can really taste is the sugar. 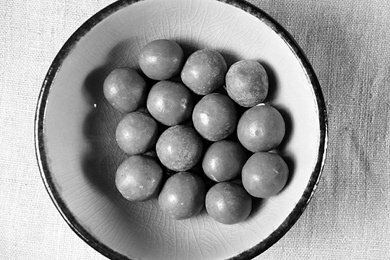 I think it is interesting that malted milk balls when they were first sold in packages in the 1950's were sold in packages of 5. 5 WHOPPERS is a reasonable treat (maybe about 50 calories). But now we buy a 3 ounce box of WHOPPERS with maybe 35 malted milk balls in it (400 calories). Portion sizes have REALLY changed and WHOPPERS are a great example of how our expanding waist lines have more to do with food marketing than our lack of will power.